Despite mediocre grades, a student gets fired up about African history and literature. She finds a mentor and becomes more socially grounded. But another student drifts through college. She struggles with pre-med studies, misses high school and fails to connect with her professors. Why does one student thrive and not the other? What kind of strategies can pull a drifting student back on course? Such essential questions were on the agenda for the “Ensuring Student Success” conference at Bates, sponsored by the Consortium on High Achievement and Success, of which Bates is a founding member. 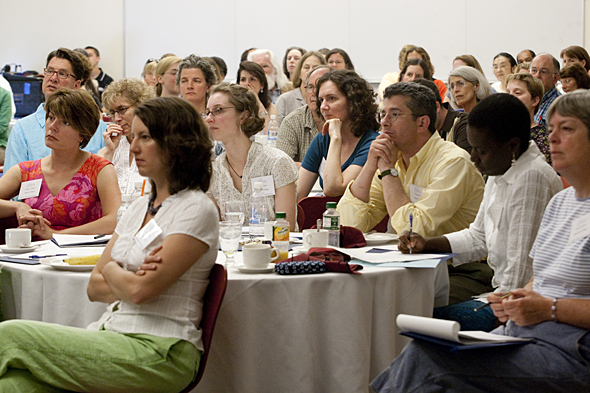 During a morning session, Bates anthropologist Heather Lindkvist presented the two case studies described above, which are derived from longitudinal interviews with 250 students at Bates, Bowdoin, Colby, Middlebury, Smith, Trinity and Wellesley colleges. The study began in 2006–07 (the students’ first year in college) and will continue into spring 2010. Befitting the writing focused theme of the conference — it was geared to humanities faculty and writing center professionals — Lindkvist and others explained how writing assignments can deepen a student’s academic engagement in unexpected ways. “Engagement occurs around interaction,” Lindkvist told the roomful of academics in the Jarnryd Room of New Commons. Tactics to promote interaction around writing can include the obvious (writing comments on a student’s paper) and newer tactics, such as “staging” or “scaffolding,” in which writing assignments are broken down into a series of shorter tasks or components. Professors should more carefully explain how their discipline’s writing style differs from other styles. Following Lindkvist, five current Bates students explained how writing assignments have helped and hindered their own satisfaction at Bates. Because the conference sponsor, the Consortium on High Achievement and Success, seeks to understand the experience of underrepresented students, the panel’s composition reflected this thrust. The five students agreed that professors should more carefully explain how their discipline’s writing style differs from other styles, and especially how college writing differs from high school writing, where the dominant style is the five-paragraph essay. 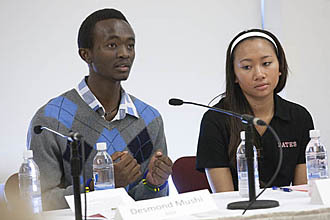 Desmond Mushi ’13 of Mwanza, Tanzania, got a laugh by saying that his unpleasant surprise was “that I would have to write!” He excelled in math in high school, and his guidance counselor told Mushi that he’d not have to write in college if he just stuck with math and science. At first discouraged by the writing and reading assignments in his course on the Cold War, yet intrigued by the topic, Mushi sought help from the Writing Workshop, from Emily Grady ’10 at the Peer Writing Project and from his politics professor, Jim Richter. “After I did my reading but before I started to write, at first there was no one to talk to,” he recalls. “But then I found that my professor would talk with me. Emily would talk with me. Kirsten Gavin ’12 of Lewiston noted that “a few professors seem naturally psychic” and tend to anticipate student questions. But with others, Gavin learned not to ask generally about the writing assignment. “That will just result in a repetition of the assignment” from the professor.